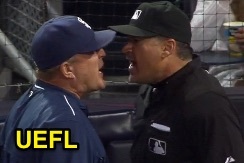 HP Umpire Tony Randazzo ejected Padres Interim Manager Pat Murphy for arguing a ball four call in the top of the 4th inning of the Reds-Padres game. With two out and one on, Reds batter Billy Hamilton took a 3-2 fastball from Padres pitcher Ian Kennedy for a called fourth ball. Replays indicate the pitch was located over the inner half of home plate and below the hollow of the knee (px .434, pz 1.505 [sz_bot 1.600]), the call was correct. At the time of the ejection, the Reds were leading, 1-0. The Padres ultimately won the contest, 2-1. This is Tony Randazzo (11)'s first ejection of 2015. Tony Randazzo now has 2 points in the UEFL Standings (-2 Previous + 2 MLB + 2 Correct Call = 2). This is the 156th ejection of the 2015 MLB Regular Season. This is the 72nd Manager ejection of 2015. This is the Padres' 13th ejection of 2015, 1st in the NL West (SD 13; LAD 7; SF 5; COL 4; ARI 3). This is Pat Murphy's 2nd ejection of 2015, 1st since June 23 (Fieldin Culbreth; QOC = Y [Check Swing]). This is Tony Randazzo's first ejection since August 17, 2014 (Lloyd McClendon; QOC = Y [Check Swing]).